Samsung is hard at work on a new Galaxy phone tentatively known as the Galaxy Folder. 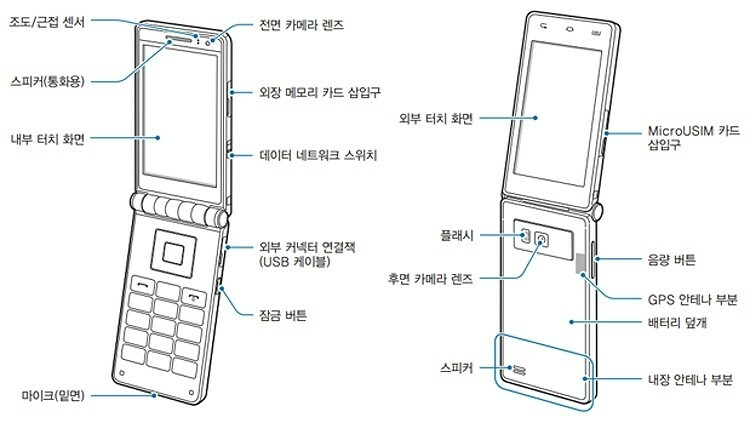 Word of the device first surfaced on a Japanese tech site when they discovered a manual on Samsung’s website complete with illustrations showing a double-sided touch screen mobile that looks more like an old-school flip phone than today’s smartphones. It’s unclear whether or not the Galaxy Folder (product number SHV-E400K) is a real product, a prototype or perhaps just an illustration created for the sole purpose of filing a patent. Just for conversation sake, let’s pretend for a moment that it’s a real product. The PDF shows a device with at least one 3.7-inch AMOLED display running at 800 x 400 that is powered by Qualcomm’s dual-core Snapdragon 400 processor with 2GB of RAM. Oh, and there’s LTE support as well. The last couple of specs point to a device (or at the very least, an idea) that was coined not all that long ago. True enough, the Korean tech giant launched a similar phone in China just last year. If the device is the real thing or even a prototype (and why wouldn’t it be, if it’s on Samsung website), it’s likely just an extension of the SCH-W2013 from last year and the SCH-W99 from 2011. A dual-screen smartphone built to today’s handset standards wouldn’t be terribly practical. Perhaps then, that’s precisely why Microsoft elected to axe the long-rumored dual-screen Courier tablet in favor of the Surface.